Environmentally-assisted degradation of structural alloys has remained a severe economic issue for utilities operating water cooled nuclear reactors. This Report reviews the key information presented at the “Fontevraud International conference” which was held in Avignon, France, in September 2014. In this conference, research work, related to field failures and issues of various reactor components, is also presented. This Report addresses the issues of BWRs along with the issues common to some BWRs and PWRs. In addition, this Report summarizes papers in the Civil Engineering (concrete structural material degradation) track as well. 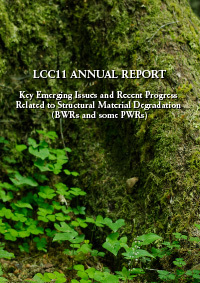 A second associated LCC11 Report reviews the papers relevant to PWRs, some BWR/PWR papers, VVER and CANDU reactors.